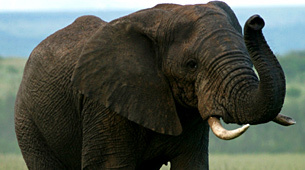 Ishasha is based in Southern Queen Elizabeth National Park (QENP), Uganda. This sector of QENP forms the largest and most significant connection to the Democratic Republic of Congoís Parc National des Virunga. Within the Ishasha Sector there are three river systems and the elephants come from the riverine forests to the community areas to crop raid. Along the eastern border of the QENP there is a hard edge of subsistence farming communities. By 1998 this border region had been experiencing serious crop raiding for over a decade, resulting in losses to the farmers and revenge killings of elephants. Some 339 crop raiding incidents in the Ishasha River Region were recorded between April 2001 and July 2003 at an average of 19 crop raids per month. In the last 18 months, some 1403 crop raiding events were fully documented demonstrating an alarming increase. With community crop losses beyond tolerable, communities have been spearing and poisoning elephants in revenge. The park border runs along the Bukorwe escarpment/ridge which lends itself towards reducing crop raiding through the construction of a trench along the crest of the ridge. The Uganda Wildlife Authority (UWA), along with the local community, has begun hand digging a 20km, 2 by 2 meter trench as the first part of a larger strategy towards mitigating crop raiding in the region. The trench will be dug from the Ishasha Customs village through Bukorwe to Rushorosa. In various places, the Bukorwe ridge has small valleys breaking up the escarpment edge. These areas are unsuitable for a trench. These areas funnel wildlife into the crops and as such are ëhotspotsí for both crop raiding and for future weaknesses in the mitigation strategy. Therefore a reinforced bank will be built that will provide too much of an obstacle for elephants and other mammals to cross. In effect this will be a solid wall, reinforced with building wire, cement and rubble. Along the wall, to avoid elephants gouging and ripping at the structure, cut wire will point out from the wall and placements for olfactory and sound based deterrents will be provided. Two to three meters in front of the barrier will be two, three-foot concrete walls. These will be far enough away from the large barrier to ensure that the elephant will not be able to reach the bank and high enough that the elephant must struggle to lift its feet over. With many of the crop raiding animals being females with young, this will also provide a significant barrier to the young. Breaches in the barrier will provide focal points for communities and park rangers to deter elephants trying to crop raid. Future additions to the barrier may include electric fencing, capsicum and sound trip wires as well as ranger watch towers. All the work will be carried out through manual labor as machines are not available or affordable. The communities have already started digging the trench and their commitment to the project is shown by the local farmers digging one day per week ñ as voluntary work. In order to hasten the completion of the trench it will be necessary to employ additional teams of laborers working across the parishes. This will have the added benefit of creating local employment and an alternative income stream for the communities.